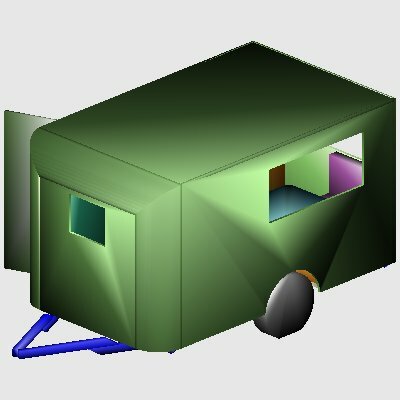 This is a design for a small fully-enclosed trailer – a ‘winter trailer’ in T&TTT parlance. · The overall size has been limited to 72” wide by 76” high – the same width and 4” higher than a Jeep Liberty/Cherokee, for example. 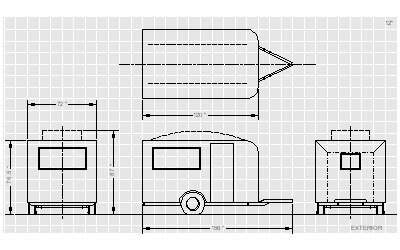 · While the trailer body is basically rectangular, there are 12” radius corners between the front and the sides and top, to reduce aerodynamic drag. If desired the same detail could be used at the rear, but there would be negligible aerodynamic benefit, if any. · There is ‘stooping height’ (61”) not standing height inside. There seem to be so few instances when one spends long standing up inside a trailer and I can put my trousers on in this height, so what more is needed? If standing height is essential, a clerestory roof giving 72” headroom is shown dotted. Thank you to ‘Shil’ for pointing out the reason to use a 64” high body – it is 2/3rds of the length of a sheet of ply, so joining two 32” offcuts makes a third panel. · Here is an enclosed toilet compartment at the front – given the lack of standing headroom a shower seems pointless, though there is enough space. · A good length of galley is available down the right side. If wanted, the window in this side of the trailer could be replaced with a lifting hatch to make the galley worktop accessible from outside. 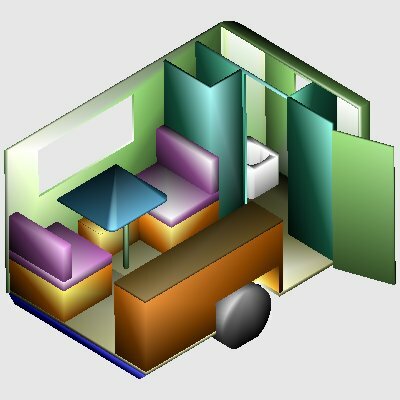 · There is a single dinette – which gives the trailer its name. The table can be used to make a single berth (27” wide), or both seats and the table can fold over to make a double bed occupying all the width to the galley – a strip at mid-height on the galley supports the folded-out seats and table. There is just room to stand (and put your trousers on) in the remaining floor space not occupied by the bed. · There is a full-height closet on the left side and space (just) for a small refrigerator in the unit on the end of the toilet compartment – the curvature of the body limits the size of refrigerator that can be fitted in. 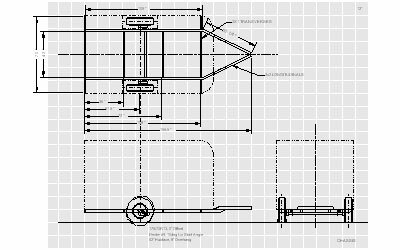 · The chassis consists of 3”x2” rectangular tube longitudinals and 3”x1” transverses. 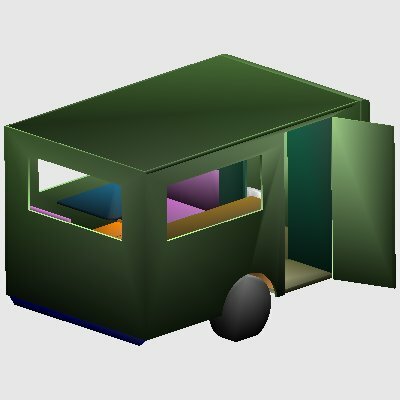 A rubber torsion axle with a 10 degree ‘up’ start angle is used to minimise the overall trailer height so that it will fit in most garages. 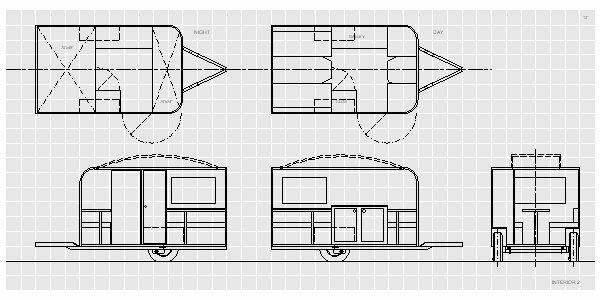 · An alternative layout is shown for Beverley that uses the ‘conventional’ double and single dinette layout used by Scamp, Boler, Trillium, etc. However with ‘only’ a 6ft wide body, all the beds are really too short at 70”. 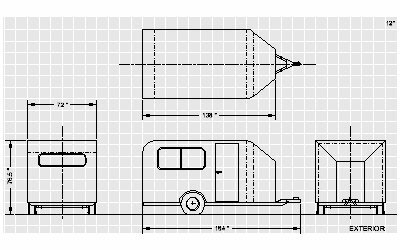 Body length : 10' 0"
Body width : 6' 0"
Body height : 5' 4"
Overall trailer length : 13' 0"
Overall height : 6' 4.5"
Overall height (celestory roof) : 7' 3"
The design is in several layers of a single drawing file, shown below (click on the pictures to see a .pdf). The 3D model is also included in this file as another layer. 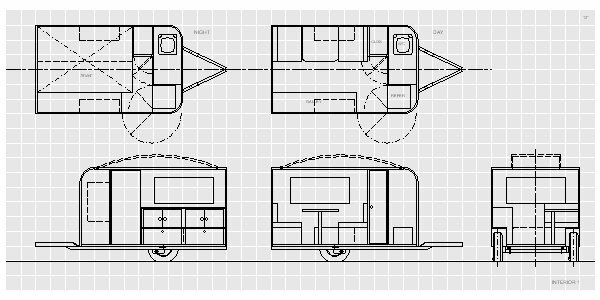 · The body is extended forward to use the space over the drawbar and the toilet relocated to this space. · An internal re-arrangement swaps the refrigerator and closet, which allows a bigger refrigerator to be fitted in. 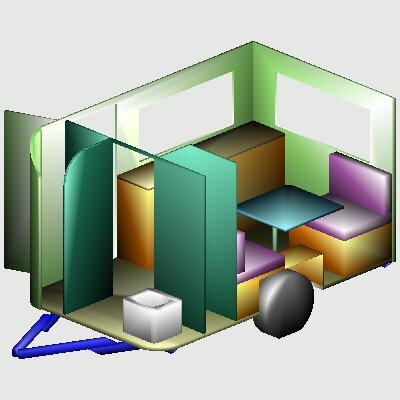 · The rear dinette seat is widened to a double. · The dinette seats are shortened to 22” depth.